American lawmakers are still in favor of killing militants with UAVs in Pakistan despite civilian casualties. The United States Congress continues to support the White House’s lethal drone program, Defense One reports. Despite the repeated killing of innocent civilians, including recently an American citizen, the controversial counterterrorism tactic is facing little public criticism or scrutiny from U.S. lawmakers. “The collateral damage has been extraordinarily low. That is really a fact. I only wish I could tell you what it was. That is the irony here. This is all classified,” Sen. Dianne Feinstein, the ranking member of the Senate’s Intelligence Committee told Defense One. Since May 23, 2013, the United States has conducted an estimated total of 96 drone strikes, killing 578 people, 26 of whom were civilians. 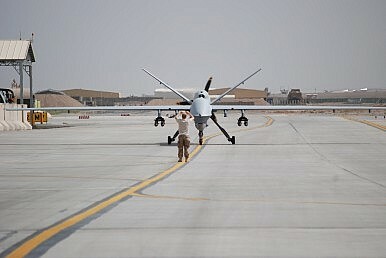 In Pakistan alone, 44 drone strikes have killed 265 people, including 1 civilian. Therefore, the policy guidance issued in May 2013 has not applied to 46 percent of all drone strikes and 46 percent of all victims. We made a mistake. You know I have been a big critic of President Obama’s. I am not going to blame him for this. I blame al-Qaida. We are not going to terminate this drone program. I am sorry these innocent people were killed. I am glad these two Americans collaborating with the enemy were killed. Please understand, we are at war. This is the way war works. It is a nasty, terrible business, but I am in it to win it.